Natalie Lloyd lives in Chattanooga, Tennessee. She collects old books, listens to bluegrass music, and loves exploring quirky mountain towns with her dog, Biscuit. 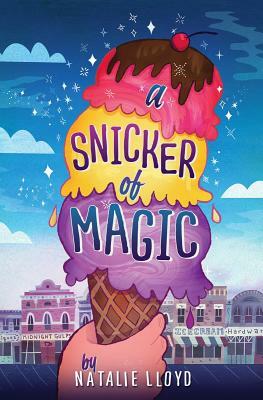 A SNICKER OF MAGIC is her first novel. The protagonist of this debut joins a growing list of endearing young girls from the South, and it’s an extra bonus that her new best friend and mentor is a boy whose method of transportation, without fanfare, just happens to be a wheelchair. Felicity Juniper Pickle, her little sister, Frannie Jo, and their dog, Biscuit, have once again been moved by their mother to a new town. This time they are moving in with Mama’s sister in Mama’s old hometown, Midnight Gulch, Tenn., which used to be renowned for its magic—the kind where people could “sing up thunderstorms and…dance up sunflowers.” Felicity, who has an uncanny ability for seeing and using written words but suffers from stage fright, wants to stay in Midnight Gulch. Her new friend, Jonah, with whom she performs anonymous acts of kindness, persuades Felicity to enter the Duel—a talent show in which her “weapon” will be her words. As the Duel approaches, Felicity and Jonah find themselves caught up in figuring out how to return the town’s magic and to reverse a curse from Felicity’s “balloon-riding, globe-trotting, curse-bearing great-great-grandfather” (surely homage to Holes). Although pacing is sometimes difficult, this tale offers all the other earmarks of fine storytelling, including colorful, eccentric characters, an original, highly likable narrator and a mighty “spindiddly” plot. From every angle, Lloyd’s first novel sparkles and radiates warmth. Felicity Juniper Pickle, 12, feels an immediate kinship with the town of Midnight Gulch, Tenn., the latest place her itinerant mother has brought Felicity, her almost-six-year-old sister, Frannie Jo, and their dog Biscuit. The remote mountain town has a history interwoven with secret magic, but most of it seems to have evaporated years ago following a dual between a pair of famous magician brothers, which divided a family and resulted in a curse. Felicity’s immediate concerns lay with her mother’s sadness and her insistence on constantly uprooting the family. With the help of Felicity’s new friend Jonah, who has his own secret magic that he works on Midnight Gulch; the stories that Felicity collects from various townspeople; and Felicity’s ability to see words that reflect people’s hidden thoughts and desires) she tries to save both the town and her own family. Working in the folksy vein of Ingrid Law’s Savvy, Lloyd offers a reassuring, homespun story about self-expression and the magic that resides in one’s mind and heart.